Mr Krabs: Here they come, lads. Mr Krabs: Thank you very much, madam. (Mr Krabs pushes the key to open the cash box over and over) I feel so alive! Money, oh money, how I love thee. From pennies to dollars. Any amount will do. Cha-ching. Cha-ching. It's no contest. There's only one thing that I love the best. From every sight I ever seen. To sweetest sound I've heard. I'd gladly give up everything for all the money that I've earned. There's nothing on earth like the feeling of greed. Squidward: Please don't do that again. Howard: (walks in the Krusty Krab) I think the stain glass barstool can go over here. And the suedo handcarved wooden sportsflag display case can go over there. Mr Krabs: Ahoy there, matey. Can I help you gentlemen with something? Howard: I'd like to speak to the owner. Mr Krabs: Who wants to know? Howard: Allow me to introduce myself. Howard Blandy: President of the Blandy Franchising Company. Howard: Get it together, little man. Mr Krabs: Sorry, it's just, uhh, you're rich. (laughs) I'm Mr Krabs. To what do I owe the honor of having you at the Krusty Krab, Howard? Howard: What would it take to buy the Krusty Krab from you? Mr Krabs: Buy the Krusty Krab? It's not for sale. You know, I may not make as much as your fancy-schmancy-migger restaurant chain, but it's the blood, sweat, and tears of a hard days work. It's not about the mon... (suitcase full of money is shown to Mr Krabs) Holy mother of pearl! I like the way you think Blandy. But it's gonna take a lot more than a suitcase of cash to buy the Krusty Krab from me. Mr Krabs: Jumpin King Neptune! Sold. Can I have my money? Howard: Just one thing. If you can sign this contract. It just states that you relinquish the Krusty Krab and all propriatary ownership thereof. Along with its employees, merchandise, logos, and cash registers. Mr Krabs: Do I still get the money? Spongebob: What's happening? Mr Krabs! Mr Krabs, they're putting up pennants in the Krusty Krab. What's going on? Mr Krabs: I'm free to do whatever I want. I can learn to ride that bicycle I got 30 years ago. Or go to the new hook museum downtown. Or even paint bowls of fruit. Aren't you happy for me? Mr Krabs: So long, boys. Squidward: Carl: Hi, gentlemen, I'm Carl. I'll be your new manager. Carl: I think you'll find working at the Krabby O' Mondays to be a both learning expierence and enjoyable one. Carl: (takes away their krusty krew hats) You won't be needing these anymore. (hands them new clothes) Now here are your new uniforms and here are the... (hands them heavy books) new manuals. See ya first thing tomorrow. Mr Krabs: (driving boat and smelling the air) The sweet smell of a brand-new day. First stop: the new hook museum. And then maybe I'll... (sees new krabby o' mondays) Hey, a Krabby O' Mondays? Not the name I would've chosen. But that's all behind me now. (later, Mr Krabs is at the Hook Museum listening to the story narrator about a 3 prong hook. Then he is at his home painting a bowl of fruit, which he actually paints a bowl of krabby patties. Then he is playing golf) Wait a minute, I htae golf. (now laying in his bed at home) Well, I've done everything I wanted to do. And it's not even noon. Pearl: (on phone) Did you see the shoes she has on? So last year. (laughs. Notices her father in the doorway) Hold on, Geena. Yeah, dad? Mr Krabs: How's it going? Mr Krabs: Whatcha up to? Pearl: I'm talking on the phone! Pearl: Dad, isn't there something you need to do? Mr Krabs: Actually, I was hoping you and I could do something together. Pearl: Get out! That's it, dad. Get a job, get a hobby, or get some friends. 'Cause I can't take it anymore! Squidward: Ahoy there, mateys. Welcome to Krabby O' Mondays. Mother: Will you sing the Krabby O' Mondays birthday song to my special little man? carl: Uhh, Squidward, can I talk to you for a second? What's our motto here at Krabby O' Mondays? Squidward: Sincere service with a smile. Carl: Well, yes, but with the Krabby O' Mondays spirit. Now, Squidward, you wouldn't want to have to talk to human resources... (big strong guy steps out) ...would you? So, what's our motto again? Squidward: Sincere service (slaps self) with a smile! Carl: Now you're gettin' it. Mr Krabs: (in kitchen cleaning dishes) Morning, Spongebob. Spongebob: Mr Krabs, what are you doing here? Mr Krabs: Retirement ain't all it's cracked up to be. So, I'm the new bus boy. (whistles as he sees Spongebob with a big smile) Uhh, ok son, you're starting to creep my out. Spongebob: (clings to Mr Krabs) I knew you'd come back, Mr Krabs, I just knew you would. Mr Krabs: Ok, boy, back to work. Mr Krabs: I'm not your boss anymore. Just call me Eugene. Squidward: Ahoy, Eugene! Would you mind clearing this table for me? Mr Krabs: Sure, Squidward. Ya know, I've never seen you this happy. Mr Krabs: That guy's a real pain in the hine-quarters, eh Squiddy? Squidward: Uhh, Eugene, I think you need to look at page 20 of our employee handbook again. Mr Krabs: Oh, I don't need Carl's silly rules. Mr Krabs: What's this? Help me. Carl: Hey, fellas, what's going on over here? Squidward: Oh, hey Carl, uhh, I was just reminding Eugene about article 24 section 3 of our employee handbook. Carl: cut the chatter and pick up a platter. Great job, Squidward. Mr Krabs: What have you done to real Squidward? Carl: The less you know, Eugene, the better. Spongebob: (takes a krabby patty from the basket) Where's the love? Mr Krabs: Spongebob, what happened to the krabby patties? Spongebob: I tried to tell them but they wouldn't listen to me. Cash Register: Your change is $1.75. Mr Krabs: Automated cash register? Noo!!! (eyes roll back in his head) Hey, Carl, what have you done to me restaurant? Processed krabby patties? Computerized registers? Mr Krabs: That's becase they don't know what they're eating. (grabs a pile of cow dung from the krabby patty making machine then walks up to a customer) Excuse me, ma'am, do you know what's in that krabby patty you're eating? Mr Krabs: See that, without all your smoke & mirrors, no one would stomach this garbage. Carl: Eugene, you're in violation of your contract. Carl: Mr Blandy? Code red. Free thinker. Howard: Mr Krabs, is there a problem here? Carl: Oh, my. (floating away in the garbage) Does this mean I won't get that raise, sir? 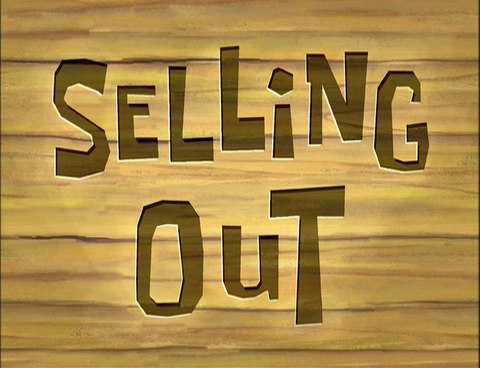 Mr Krabs: I'll buy it for full price. Friend: Sold. We won't be needing your contract anymore. Nice doing business with you. Mr Krabs: Pleasure's all mine. Now get out of me restaurant. (laughs) We did it, boys. The Krusty Krab is ours again. Ya know, in a fit of meniachal rage, I may have destroyed the resturant, scared away all our customers, and forced us into bankruptcy because I returned nearly every penny I sold this stink heap for, but it was all worth it. And I got back the love of my dear friends.